Miss Representation explores women’s under-representation in positions of power and influence and challenges the limited and often disparaging portrayals of women in media. The film Miss Representation exposes how American youth are being sold the concept that women and girls’ value lies in their youth, beauty and sexuality. It’s time to break that cycle of mistruths. In response we created MissRepresentation.org, a call-to-action campaign that seeks to empower women and girls to challenge limiting media labels in order to realize their potential. We are uniting individuals around a common, meaningful goal to spark millions of small actions that ultimately lead to a cross-generational movement to eradicate gender stereotypes and create lasting cultural and sociological change. World Aids Day and the things we don’t want to talk about! And for that, I want to raise another face of the HIV/AIDs prevention work that most times people don’t really want to talk about! In late October 2011, world population will reach 7 billion people. It is critical that we unleash the power of women and girls to alleviate poverty and accelerate progress on all of our global development goals. When women are healthy and educated and can participate fully in society, they trigger progress for themselves as well as for their families, communities and countries. 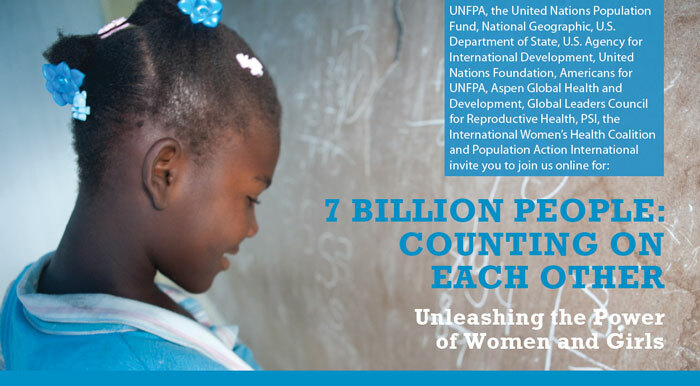 Help us raise the profile of women and girls, unleashing their potential and empowering them to be engines of change. 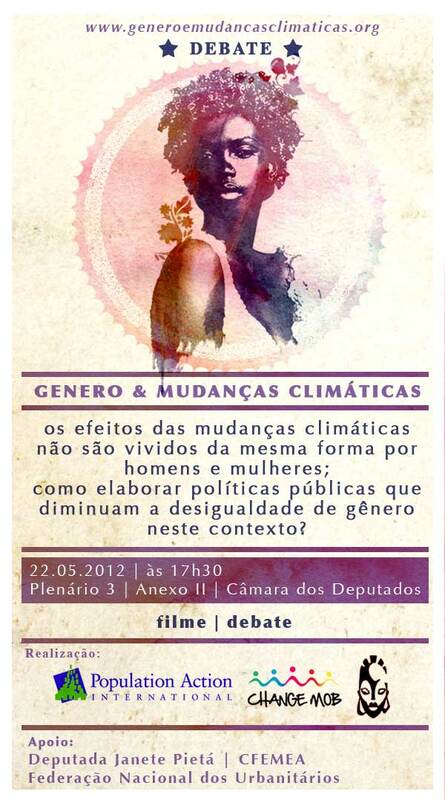 Tomorrow, UNFPA and partners will be hosting a discussion on this matter, and you can be part of it! This event will be live-streamed and posted afterwards at http://www.7billionactions.org. Follow on Twitter at @7BillionActions and discuss the event using #7billion. Or even share your story on the 7 Billion Actions Facebook Wall. Gender and Sexual Reproductive Rights and Health are definitely in the agenda here at the DPI. I’m at the side-event: “Giving a Voice to Grassroots People – The Fulda-Mosocho Project in Kenya” that is working to prevent Female Genital Mutilation and by preventing FGM is connecting the dots between protecting the planet and giving people the change for a better life. I just landed in Bonn, for the 64th Annual United Nations Conference for Non-Governmental Organizations associated with the Department of Public Information, on the theme“Sustainable Societies; Responsive Citizens”. I´m here to work as a rapporteur for UNFPA particularly trying to advocate for a greater youth participation as well as exploring the linkages with the ICPD mandate. I´m very excited about the next couple of days. And since the conference works start only tomorrow.. I wanted to share this great article written by my friend Dominic Stucker together with Lisa Marika Jokivirta, that is super worth readying as well as very useful in our advocacy efforts!!! Five reasons why young people are needed to solve the climate crisis. We were recently blown away by a young woman from Siberia who singlehandedly took on a group of white-haired experts on climate change. The group of scientists were lauding the use of GPS in monitoring land use change when this young woman politely raised her hand. Silence around the table; one of those silences that speaks louder than words. Suddenly, this twenty-something year-old defies all the connotations that might come with her “youth” status. She is not apathetic, inexperienced or naïve. She has seen the direct impacts of climate change on her homeland and knows the finger has been pointed in the wrong direction for too long. She doesn’t belong to the almighty “old boys club,” but that is precisely her greatest asset. She also isn’t scared to take them on. And this young woman from Siberia is not alone. She is part of a larger, global body of young people—students, graduates, researchers, educators and environmental activists between 18-25 years old—who are taking on the world. Some are even younger. At 15, Mohamad Axam Maumoon of the Malidives was selected from among participants in the Children’s Climate Forum, organized by UNICEF and the City of Copenhagen to participate in the 2009 UN climate change negotiations. In this role, Axam was interviewed by radio host Amy Goodman of “Democracy Now!” Concerning the impacts of climate change on vulnerable countries, cultures and peoples, he pointedly asked listeners and negotiators: “On the basis that you know what you are doing is wrong, and you can see that the victim is begging for mercy … would you commit murder?” Reminiscent of then 12-year-old Severn Cullis-Suzuki’s impactful speech at the 1992 Rio Earth Summit, Axam represents the first of “all generations to come” that she invoked. If you think we should include young people for tokenistic purposes, think again. There is an unprecedented need to engage them and collaborate across generations for effective climate action. Here are five reasons why. The numbers speak for themselves. There are more than 1.2 billion people under the age of 25. If they all formed a country, they would be the second largest one in the world. For those who ask why we should take on board their needs, experiences and views, we instead ask: How could we not? There is great power in numbers; and it will be necessary and beneficial to include young people in the mobilization efforts for effective climate change mitigation and adaptation. This is particularly true in the Global South. Almost 90 percent of the world’s young people live in poor countries, those least responsible for and most adversely impacted by climate change. The educational attainment of young people, their decisions about lifestyles, sexual behavior and childbearing, and the transmission of ecological values, knowledge and practices have profound effects on their own lives and on generations to come. The green economy is largely in young people’s wallets. Young men and women constitute close to one-fifth of the world’s population and their combined purchasing power translates into significant market control. Youth in the U.S. spend or influence the spending of an estimated $300 billion per year, or one-third of all consumer expenses. It would be a mistake not to include young people in the design and implementation of sustainable lifestyles campaigns and awareness raising efforts. Beyond consumption, young people need to be encouraged to take up green jobs. This can simultaneously address unemployment and disenfranchisement among the large youth demographic, and turn linear production systems into sustainable cycles. The UN Environment Program estimates the global market for environmental products and services will double by 2020. Science alone hasn’t been the solution. Young people and future generations have the most at stake in the climate policy debate. Until now, science-based arguments alone have not produced strong policies. Widespread appeal from young people could make policy-makers reframe their interests in the spirit of intergenerational responsibility and respond with more meaningful climate action. Data coupled with narrative—science with story—may help inspire sound climate policy. Youth represent and can articulate that story, a story that bridges into a future that many current policy-makers will never experience. In so doing, young professionals should not remain outside of decision-making processes but get involved in environmental governance. Young professionals are a largely untapped resource. Globally, there is a largely untapped resource base of young professionals—highly educated students, educators, and environmental and social activists who want to get more involved. At Earth Charter International, the Costa Rica-based sustainability NGO where we both previously worked, the volunteer-based youth program quickly became the most active arm of the organization. Young people from around the world took initiative to translate policy documents, organize climate rallies, launch tree-planting programs and inspire other volunteers to act both online and on the ground—a diverse range of climate change action at multiple levels of impact. We see similar enthusiasm and talent among young professionals in the International Union for Conservation of Nature’s Commission on Education and Communication, where we volunteer as members of the Young Professionals Leadership Team. They still think outside the box. Perhaps the greatest power of young people is their tendency towards creativity, innovative thinking and not simply accepting older ideas. Like adults, not all young people are destined or even interested in becoming sustainability leaders. But today’s youth are perhaps the most technologically savvy, socially connected group in history; and their power to envision a sustainable world, identify high leverage strategies, mobilize individuals and affect positive change should not be underestimated. The point is not to train young people to work within the system. The challenge is to open up new spaces for them to share their unique perspectives and transform the systems they have inherited. According to Albert Einstein, “No problem can be solved by the same level of thinking that created it.” Perhaps this can be extended to question why the “old boys club” that is largely responsible for our present socio-environmental crises remains the dominant voice at the climate policy table. Opportunity lies in cultivating young people’s abilities to engage in systems thinking and analysis, coupled with visioning new ways of being and doing that bring balance to our relationships with one another and our environment. We must give each other permission to be creative and experiment, make mistakes and learn our way together into a sustainable future. The good news is many organizations, corporations and governments are waking up to the potential of young people to contribute to climate action. Much work, however, remains. 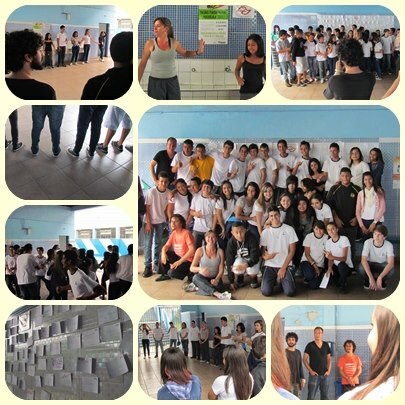 The rights and decision-making capacities of young people remain largely unrecognized and they are often denied participation in (particularly higher-level) governance processes where their unique perspectives and innovative ideas could help shape more effective policies. This is a defining moment, a defining opportunity. We encourage you to ask yourself what your organization is doing to engage young people in climate change action. What opportunities might exist for increasing youth engagement and intergenerational partnership?